Being land locked for years at a time makes one miss the Ocean, but I'm happy to say that this summer I got to see or touch the Pacific Ocean for ten whole days in a row, on four different beaches! 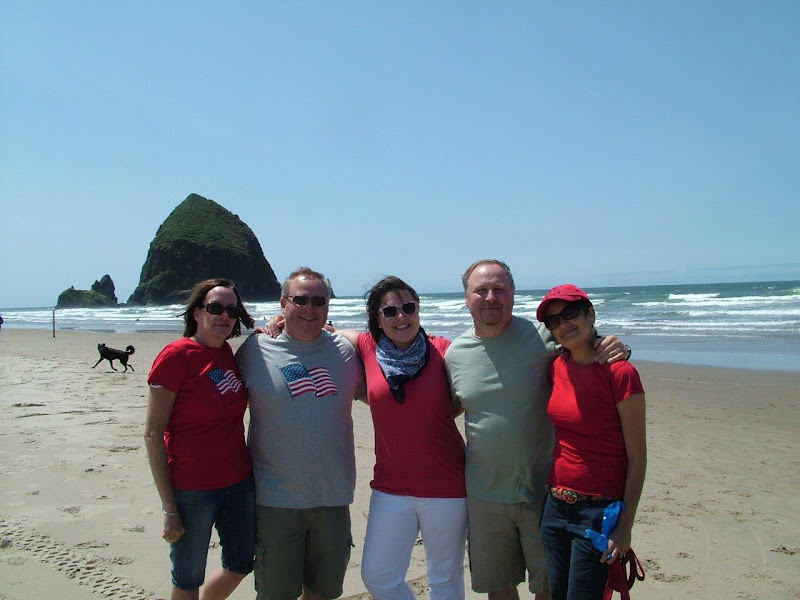 I went to Cannon Beach to be with my uncle and aunt for the weekend, left Monday for work, back Tuesday night for the 4th of July, back to work on Thursday, then Friday night, down to Winchester Bay with my mom's side of the family! All I can say is... I can't wait to buy my beach house. Me, my cousin Rachel, and Cannon the dog headed down to Short Sands beach in Oswalt West State Park. I'm pretty sure this is my favorite beach I've ever been to. It's about a mile hike in, lots of surfers go there, and it's the perfect place for dogs to run around and have fun! We went to Cannon Beach a few times over the ten days. It's beautiful and iconic. We went down to Haystack Rock at low tide and saw some adorable baby seagulls up on the rock. There was also the 4th of July parade complete with candy and lots of fun. My cousin is selling baked goods to go on a Washington DC trip next year and we made some scones and cookies to sell at the parade. Cannon Beachers are always willing to pay money to help a cute little girl! Before they banned fireworks on Cannon Beach, the 4th of July was the most magical night of the year. Dozens and dozens of families would go up and down the beach and light off those awesome aerial fireworks that you can only get in Washington. Even if you didn't have any, you could just go and watch everyone else's. Now... in the name of wildlife conservation, fireworks on Cannon Beach are banned. But have no fear, Arcadia Beach is here. There are still a few families that go down to the beaches south of Cannon to do fireworks, light a bonfire, and enjoy America's birthday. To celebrate my cousin's birthdays, the Strong and Rounsville families always go down to Winchester Bay for a week or so. My uncle likes to fish and this weekend we got to go crabbing, fishing, and beaching. We ate some amazingly fresh seafood, played in the sand, sat around the campfire, made cake pops, and they even gave me crab to take home and make crab bisque!